RIP Jared goat. Thanks for the memories and the kids. Jared was dead when I got home tonight. I knew better than to hope, so I'm not all that broken up now. I had three extra days to face the loss before it happened. And I guess I'm getting a little better about letting go. Jared was ten eleven and a half years old when he died. Born in Pennsylvania in spring of 2004 2003, he came to our farm as a yearling in July of 2005 2004. I chose him because of his bloodlines and his good looks. 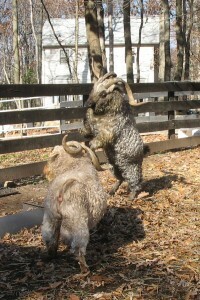 Despite having close horns (a big flaw), he did very well as a clean fighter and a good sire. 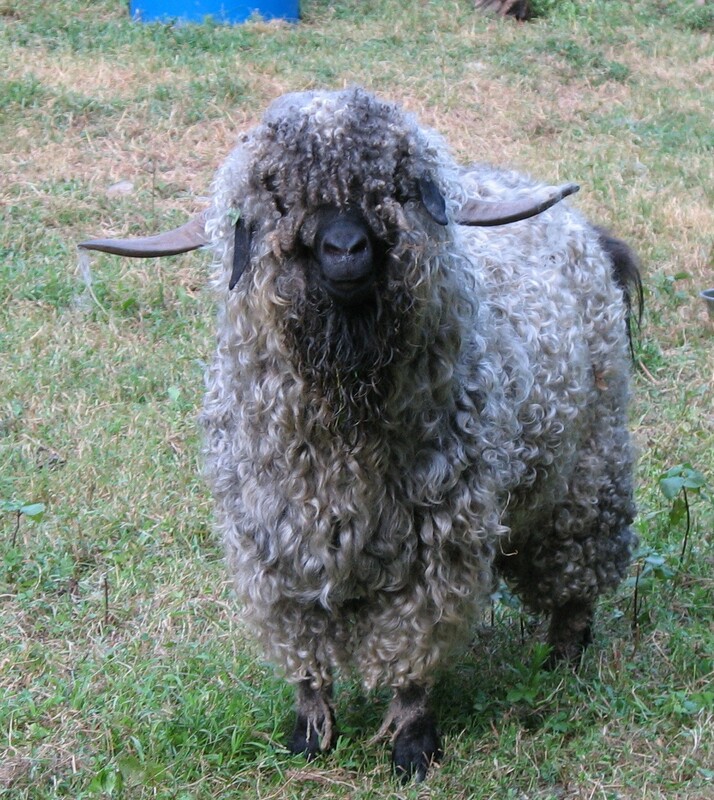 Once he got over his teenage idiocy, Jared settled down to be a quiet, companionable guy who only really let his feelings show during shearing, when he bellowed like a cow until he was six. He knew how to rumble and how to sing his love songs to the girls. He was a polite guy at the hayrick, and reasonable about foodbowls, too. Jared sired more than thirty kids here; I'll have to do the math for the full count. He passed on his recessive genetics in dramatic stripey form to Madison, Ria, and Orchid, and then to his grandson Diego. For those who have been to the farm in the past few years, you might like the reminder that Jared is father of Scout (Sashimi), Anna and Lerris (Jessie), and Madeline (Mona). His grandson Ari (Anna x Cookie) is now standing stud here, with two great-grandchildren on the ground. While I can't claim to know the fates of all of his kids, Justin (Crystal) stood stud in Maryland for a few years, as did Madison (Sashimi) in New York and Houston (Sashimi) over the hill south of me. His daughter Maggie (Jessie) is also a grandmother. 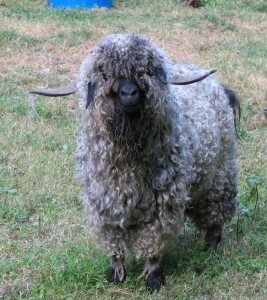 Angora goats *can* live to be fourteen. Most web-based sources say 9-11 years is a normal lifespan range. So ten is respectably eleven is darned old for a stud. 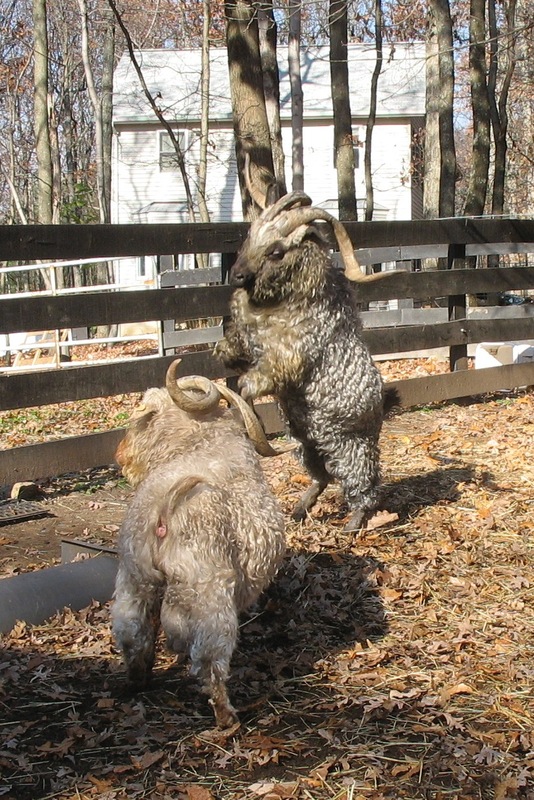 Because of all the fighting and loving that they do, bucks' bodies break down and betray them more quickly than even the doe goats who have kids every year. And in the past two years, Jared aged very quickly. Wethering him and retiring him probably saved him from dying of a heart attack, but also took away his fighting hormones, and he lost a lot of bulk last year. Once I do the math, I can feel both proud and worried about the older goats here. Jessie and Summer are a year older than Jared (both born in 2002), and Loki is a year behind. Alys, Anna, and Dahlia are eight and a half. ... Sancho* was born in 2001. Yes, he is coming up on fifteen this next year. This group of older goats provides some argument that we have been reasonably good goat-parents, even with the five preventable deaths on my record. However, due to this aging group, I expect that there will be more losses, more frequently, over the next few years. * It is worth noting that Sancho is a Pygmy/Lamancha and was wethered at two months old. Pygmies can live to be 18, and Lamanchas can live to 15, so he is right on target with that good ol' hybrid vigor going for him. And, like in the first comment, sounds like far more than simply reasonable. This page was loaded Apr 20th 2019, 3:11 am GMT.